A new report reveals the iPhone (s aapl) is still on top when it comes to the state of app development, but Android (s goog) is hot on its heels. Coming in close behind both, however, is the iPad, giving iOS a strong lead overall. But is it likely stay that way for another year? In compiling the report, Millennial Media surveyed more than 500 developers, publishers and advertisers to find out their current and future plans in terms of mobile app development. The results provide a snapshot of where development investment is currently, and where it looks to be heading in the future. While the iPhone came out on top, as mentioned, with 30 percent of development efforts geared toward it, it suffered a decrease year-over-year. RIM’s (s rimm) BlackBerry was the only other platform that saw a drop in developer preference from 2009 to 2010. Android, Windows Mobile (s msft) and Symbian (s nok) all saw growth over the course of the year, as did Apple’s other development platform, the iPad. The iPad accounted for 21 percent of active development, giving iOS a total slice of 51 percent when you combine both platforms. Android is being developed for by less than half that many respondents. When Millennial looked at what new platforms developers want to pursue in 2011, though, Android’s prospects seem much brighter; 29 percent of those surveyed indicated they had plans to introduce Android support in the new year. The iPad and Windows Phone 7 tied for second place, with a 20 percent share each of respondents planning software for those mobile platforms. What’s the bottom line? iOS looks to remain in front in 2011, but Android will probably come very close to catching up. Does that mean Apple is falling out of favor with developers? No, it just means devs and publishers are more interested in diversifying their portfolios than they have been in the past. 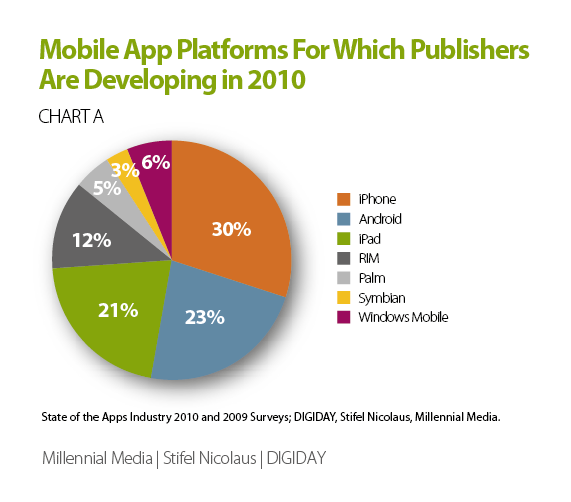 Many studios want to provide offerings for all viable mobile platforms, not choose one over the other. Interest in a platform among those who create and distribute software will grow based on factors like reach, demographic and the potential for increased sales. 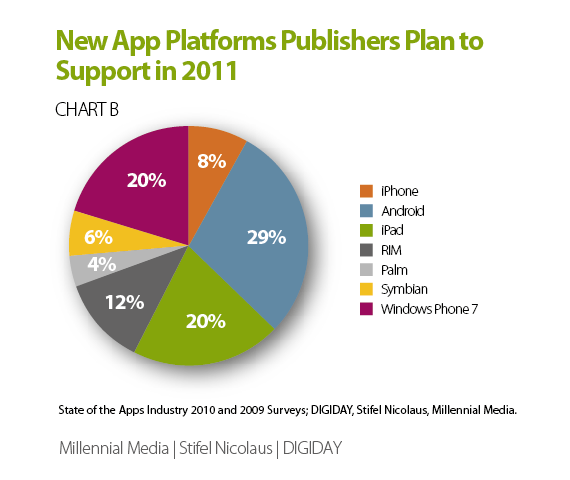 Only 8 percent of developers said they planned on supporting the iPhone as a new platform in 2011. But the iPhone having less growth makes sense, since it already boasts the largest active development community. Apple has nothing to worry about until devs start abandoning the platform, or working on Android apps to the exclusion of iOS ones.